“The Spirit Dancer understands both sides of self-expression. In the first stage we get our inner vision, feelings, and creative impulse out into the world through our art, whatever that is. Then our expressions are reflected back to us from the mirror of other people’s perceptions, and we discover what our art awakens in them. 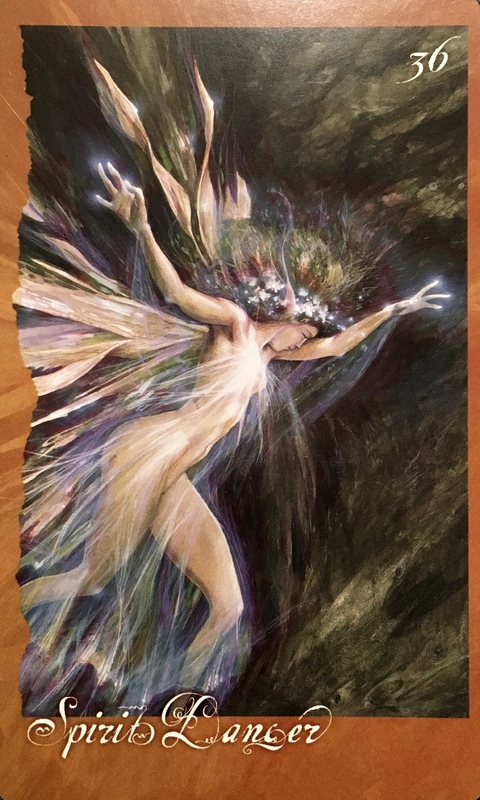 Spirit Dancer encourages us to take creative action from our place of personal power, the inner core of true feelings and understanding within us. She wants us to clarify our vision, find the creative potential that lies hidden in paradox, confusion, and chaos, and turn these into a free-flowing, finely balanced, evolving order. She wants to aid us in making our best fantasies real. With freedom comes a lightness of being, if you allow it. If you allow yourself to fully embrace the freedom that is offered to you now. Can you receive this precious gift? Can you see how things have shifted and changed? Can you feel how you are now fully in control, fully responsible for creating your new reality? You have the gift of renewal, rebirth and re-creation of yourself. Where will you start? Ten days left until Venus turns direct. We are setting the stage for our creations. We have been moving over these last few days out of the darkness and into the light. It is like the dawn coming after a cold dark night. What can you change today to let yourself know that this new phase of your life is real and that this new way of being is permanent? Can you declutter, clean and clear your home and office clearing the air and making space? Can you let your creative juices flow and make something wonderfully artistic? Can you get out of your comfort one and wear something bold? Change your appearance up? Artistic self expression is a wonderful way to let those around you see the true you. Whatever you choose, do what feels right for you; your true authentic self. Show everyone how you want to present yourself to the world. We cannot experience true joy when we are living by old belief systems, worrying what others will think, or trying to please people. We must step out and put ourselves first. With big open hearts, and open minds. Love all those unique aspects of you, and share them with the world. Doing so will inspire others to join you. Find your grace, your harmony, your inner peace… and balance it with deep passion, vitality and zest for life. This is the recipe for reinventing yourself and your world. And you have everything you need to get to work and do it! Dance out of the darkness and into the Light.